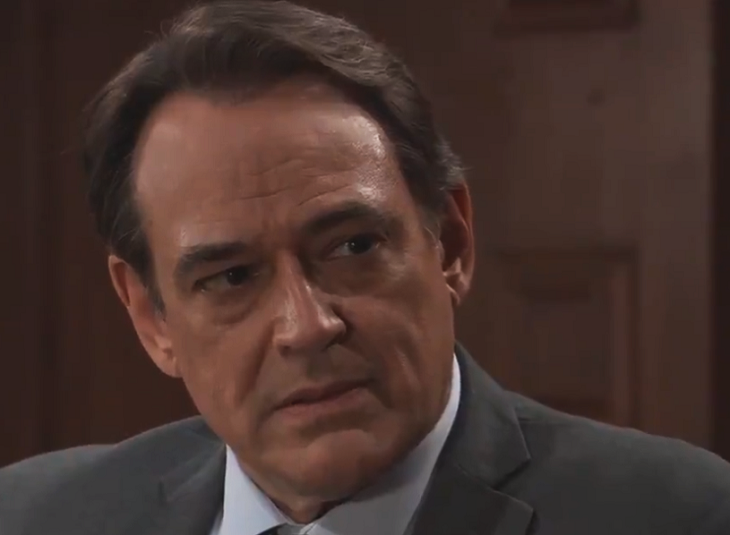 General Hospital (GH) recap for Friday, April 12, 2019, reveals Laura Webber (Genie Frances) just got out of a board meeting and met with Spencer Cassidine (Nicholas Bechtel). Spencer has a problem with the vending machine, Valentin Cassidine (James Patrick Stuart) helps him. Spencer and Valentin argue over Sasha Gilmore (Sophie Mattsson). Valentin brings up the election fraud. Valentin refuses to set a schedule with Laura for Charlotte Cassidine (Scarlett Fernandez). He doesn’t want Charlotte and Spencer together. Valentin bumps into Peter August (Wes Ramsey) who apologizes for doubting his honesty. Peter wants to see Valentin and Nina Clay (Melissa Reeves) happy. Valentin excuses himself an leaves. Valentin speaks to Nora Buchanan (Hillary B. Smith) at the courthouse. Kevin Collins (Jon Lindstrom) tells Laura the charges were dropped and he is there to appeal the board’s decision. Laura wishes Kevin luck. General Hospital’s Hamilton Finn (Michael Easton) is practicing his proposal to Anna Devane (Finola Hughes). Laura interrupts Finn and asks his opinion on Ryan Chamberlain (Jon Lindstrom) surviving losing his hand. Finn tells Laura that Kevin could have survived. Anna and Robert Scorpio (Tristan Rogers) are having tea. Anna tells Robert she believes Alex Marick (Finola Hughes) is Robin Scorpio Drake’s (Kimberly McCullough) mother. He tells Anna he knows the difference. Robert can’t believe that Anna even considers this possibility. He believes Anna is using this to punish herself. Robert refuses to let Anna ruin the best thing that ever happened to him. Robert tries to reassure Anna that she is Robin’s mother. Finn joins their conversation and says Alex could be Robin’s mother, but it isn’t likely. Anna needs to find a way to uncover the truth. Robert refuses to stay while Anna tortures herself; she has Finn for that. General Hospital’s Sasha joins Peter and Maxie West (Kirsten Storms) for lunch. They want to make amends. Sasha tells Maxie and Peter she doesn’t believe Valentin would do anything to hurt Nina. Maxie tells Nina what she has done for the magazine. Nina is upset and doesn’t want to talk to Maxie. Sasha comes in and wants Nina to hear Maxie out. She tells Nina she and Maxie are family and people make mistakes. Sasha tells Nina that love and forgiveness keep them together. Sasha forgives Maxie and Maxie thanks her. Maxie starts to leave, and Nina calls her back. Maxie thanks Sasha for sticking her neck out for her. General Hospital’s Curtis Ashford (Donnell Turner) asks Nina how the search for a kidney donor is going. He tells Nina they need to find Jordan Ashford’s (Briana Nicole Henry) donor sooner or later. Curtis tells Nina he wants to take on new work. Curtis thinks work would keep him off Jordan’s back more. Nina doesn’t have anything but tells him about Peter and Maxie’s DNA test. General Hospital’s Jordan tries to convince Margaux Dawson (Elizabeth Hendrickson) to reinstate the search against Ryan, but she refuses. Ava Jerome (Maura West) is upset that the search has been dropped. Nora has called a special session with the court to try and get the charges dropped. Nora requests that all the charges against Kevin be dropped. Margaux accuses Nora of stalling the judge wants sound legal reasoning. Ava hints that she can take care of Ryan, Jordan calls Julian Jerome (William DeVry) to control Ava. Nora says the stated recognized Ryan as being dead, so Kevin didn’t break any laws. Nora continues to site cases. The judge orders that Nora is correct and the charges against Kevin are dropped. She is warned against pursuing this matter because of her past failures. Margaux leaves, saying this isn’t over. Kevin is shocked that it’s over. Ava stops for a coffee, and someone is watching her through the window.